Welcome home to 4063 Pine Creek Road on Johns Island! This beautiful newly constructed 3 Bedroom, 3.5 bath, single level house is a rare find on Johns Island. The home sits upon 1.5 acres of woods situated between a lake and the marsh at Pine Creek. The home was built in 2015 and has a modern open living and kitchen space. The home has 8-inch wide oak floors throughout the living areas and bedrooms with tile in the bathrooms. The 9 foot ceilings are "topped" with crown molding and vaulted living room ceiling truly opens up the living room and allows gleaming sunlight to pour into this home. The home has been updated in the past year with custom light fixtures, built in media storage, custom shelving in the master closet and garage, and soft closure drawers in the kitchen, butler's pantry and all full bathrooms. The chef's kitchen boasts a gas range, granite countertops, new appliances, and plenty of storage. There is an eat-in nook off the kitchen that overlooks the screened porch with a tree-lined view. If Costco runs are a must for you, you have plenty of room to stock your shelves in your walk-in pantry. There is also a separate dining room with wainscoting and plenty of natural light. The living room with a wood burning fireplace and built in media storage is open to the kitchen and provides easy entertaining or a cozy place to relax. Each of the three spacious bedrooms has a walk-in closet, full bathroom, ceiling fans and beautiful nature views. Two bedrooms are located on one wing of the house with the master suite on the opposite wing. The master bedroom is the owner's personal oasis with private views of nature and a large sitting area. The master bathroom boast a separate soaking tub, tiled walk-in shower, and private water closet aka the "marriage saver". The 12 x 8 foot master closet is through the bathroom and has custom built-ins. 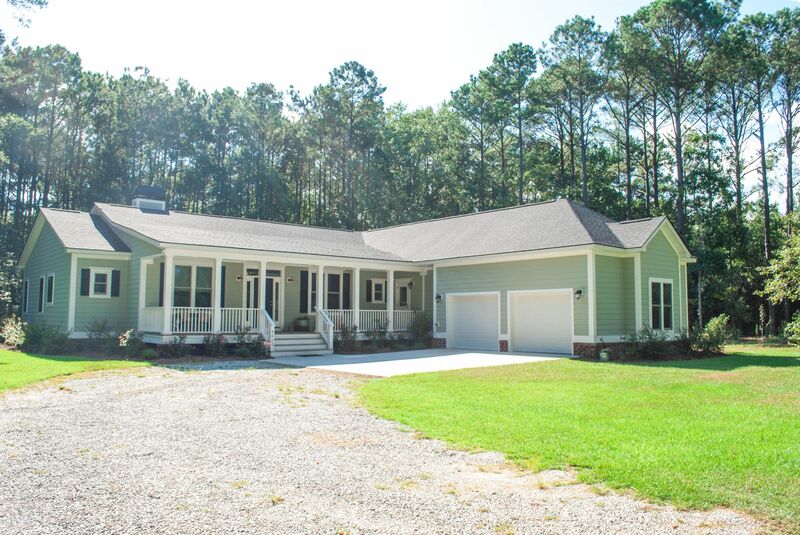 The attached oversized 2 car garage is a dream come true with custom built in tool storage, a 30 foot work bench, and windows that over look your Johns Island paradise. The yard is freshly landscaped with centipede grass and an in-ground sprinkler system. Off of the 2 back porches (one screened and one open) is a hand laid brick pathway leading to the custom built 20 x 40 foot fenced in garden! This spacious food growing "arena" is wrapped with a 7.5 foot high fence to keep out the majestic deer that stroll through your yard and protect your 5 elevated garden boxes. Owners are happy to leave the adjacent custom built chicken house for a buyer who is interested in true country living. Beautiful oak trees on the property would be perfect for a tree house or hanging swings. If you are worried that over 2300 square feet isn't enough for you, the owners started to layout an 800 sq foot guest cottage on the property. The spot has been cleared, leveled and the prepped for this accessory building. The custom plans could be yours if you choose to start the build or the area could be great for a play set, fire pit, outdoor shed or a picnic area. To wrap a beautiful big red bow on this package is the location; you are surrounded by picturesque mother nature where you are serenaded by crickets in the evening and birds chirping in the morning, but only minutes to luxurious Kiawah beaches, some of the finest dining in the Country(Downtown) and some of the industry that is driving our great city(Boeing, Volvo, Daimler).